This morning I had a luncheon to prepare for but luckily I remembered to include in my preparations, an almond peach tart. This dessert is a variation of a recipe that was sent to me by my neighbor’s sister in the United Kingdom. In this recipe, you take sweet dough and line a pastry pan. 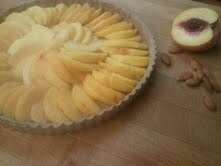 Then you prepare the fruit and place it in the crust. After that you pour an almondy batter over the top of it. It smells heavenly when it bakes and I can only hope that it tastes just as good. This evening I also was preparing food. However, this time the food was for a group of people that were fundraising for a cause that was close to their hearts. A friend of ours, Leslie Kendall, was also donating to this organization, but instead of preparing food to be served, she was preparing to sing her heart out for the attendees. Leslie is also a voice coach. A few years ago she helped my daughter prepare for an audition. The transformation in my daughter’s persona was unmistakable. The song that she sang for her audition was a Cole Porter tune called “Always true to you in my fashion.” It was such a treat to see my daughter command the stage when she sang… and she got that confidence, in part, from Leslie. Tonight I brought Leslie an Almond Peach Tart. It is a sweet (and tangible) way to thank her for sharing her amazing gift with all of us.